Another morning, another departure. Another farewell to new friends, en route to stay with more strangers. We had a great time with Yves and Christine. In particular, it was so affirming to meet people who had done what we are doing, and more, long enough ago to be able to judge that it worked! They're off soon to return to the road without their now grown-up children, at which I will be pleased to hear some more feedback, because I would still like to take Katie for an epic trans-continental bike trip once our children are packed off to university, before they beat us to it! Ruth took a turn this morning at writing in our hosts' visitors book. No sooner had we dropped back into town than we bumped into another touring family with their children and trailer, in the supermarket car park! Jean-Yves and Caroline, Romane (3) and Gabin (2) were also headed for the north coast and we had an interesting chat with them before getting underway for real. Thanks to our changes of plan, today has been our first actual low-mileage day, as we prepare to turn north tomorrow and head towards St Malo and home. Finally, we've had some time to do some filming and photography. Filming yourself on trips like this is rather harder and very much more time consuming than it looks, and there are lots of folk out there having a go at it, with varying degrees of success. It adds a lot of weight, it increases the 'battery burden' significantly, and most of all, you have to find a happy balance between riding and filming. Too much stopping and filming can become tiresome for the group; too much riding and you never have time to film any of what you're passing through. Throw in a triple dose of 'never work with children and animals' and you're asking for trouble! Today turned into something of a 'filming day', which has been fun, although the quiet paths of the canal aren't all that representative of the greenways we have been on for much of the trip so far. It's also difficult to get the camera very far from us within the confines of the towpath. Canal towpath isn't really our favourite kind of route for covering ground, although it does increase the likelihood of finding picnic and play areas en route. Like some railway paths, they can serve to insulate you from the places and people around you. Being flat they also demand a steady slog, particularly noticeable when touring, and depending on how the path is engineered you may have lots of width restrictions, gates and road crossings to contend with. Most of all, if I can say this, we don't like trying to put the miles in when we are tripping over the kind of 'Sunday afternoon' dog walkers and cyclists who are only going to cover a mile or two all day and who aren't attuned to sharing space. None of that is conducive to riding freely. Mercifully, although the section we used yesterday ticked many of these unfortunate boxes, moving further inland (as generally with Brittany, we are finding) caused things to quieten down considerably. We didn't see many people at all today, of any kind! Decide that there's a shot to be had, and stop; shout to Thomas Ivor to pull up. Park the bike up and un-bungee the tripod; shout louder at Thomas Ivor's rapidly disappearing form. Get back on the bike, hunt Thomas Ivor down and bring him back to where I've left the tripod at the side of the path. Extend the tripod legs and plant it. Try to control breathing. 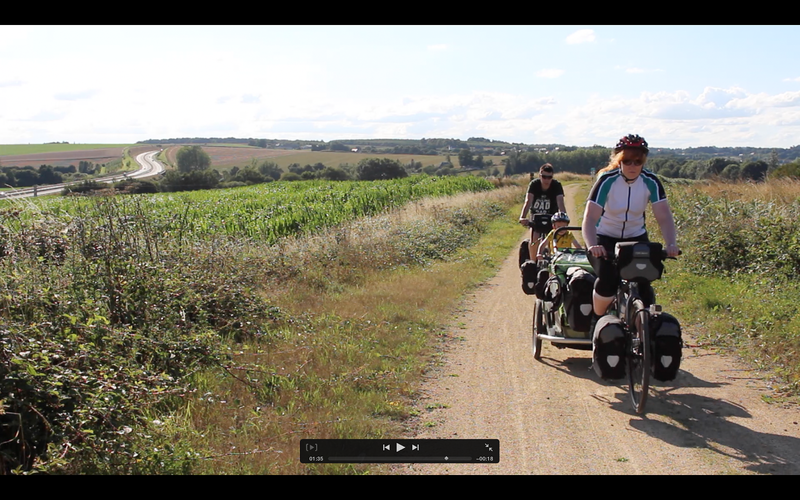 Camera out of bar bag; start explaining the shot to Katie so she can turn the trailer round and return to the point we need to film from. Mount the camera, send Thomas Ivor to follow Katie and use his retreating ride to check the shot out. Set the camera rolling; retrieve bike and set off to join the others, mindful of the precious memory card and battery capacity that is already being used up. Turn back half way to make sure it really is on. Discover that it is. (Note - miss out this step and it isn't). Finally rejoin the rest of the team, as the sun ducks behind a cloud. Nominate who will ride past the camera in what order; remind Thomas Ivor to keep to our pace. Wait for the sun to come out again. Dog walker leaves shot as the sun goes in again. Set off anyway, in the determined order. Thomas Ivor promptly drops one of us / fails to keep up / has a huge and inexplicable wobble / fails to set off at all because he's seen a wasp several yards away (delete as applicable). Turn everyone round to try again. Seconds later, tripod blows over and sun comes out on empty road. Start muttering to self. Retrieve camera. Stop film and delete the evidence. Repeat Step 8 on way back to the group. Sun goes in. Contemplate asking for the emergency diazepam stash whilst waiting for the sun to come back out. Sun comes out; wait for stream of traffic coming the other way. Decide 'stuff it' on the solar front and set off anyway. Sun miraculously comes out and all is going well until a van drives past the camera right in the middle of the shot. Frantically dash back and do it again whilst everything's looking good. Katie's lip now bleeding from trying not to say 'Calm Down Dear', in the style of Michael Winner. Take number goodness-knows-what. Get in! Upon reviewing the footage, it turns out that an enterprising Thomas Ivor has pulled a face as he passed the camera. Decide at the last minute not to pitch his bike into the hedge. I'll only have to retrieve it myself. Ruth announces she's done a poo. Bite own lip. Give up and decide to make do with whatever footage we have. Dismantle the camera and tripod. Look for the bungee that holds the tripod onto the rear rack, which pinged off into the grass earlier. Hurriedly lash the tripod back onto the rack and set off after the family. Breathing exercises. Wonder "Good heavens, what was that" (or similar) as one end of the bungee comes free, catches on a spoke and pulls itself apart, firing the hooked end through the drivetrain and nearly pitching you off. Improvise a new method of attachment for the tripod using the top straps on the panniers and the remains of the bungee, vowing never to waste time and effort trying to film like this ever again. In through the nose, out through the mouth. Flog back up to the rest of the family, who by this time are wondering what on earth has happened to you and have stopped. Forego the break they've just had, and take the front once more. Move on, look for another spot, and repeat. Now, I admit that this may sound like an exaggerated version of events but every stage has genuinely happened, on occasion on the same afternoon and several of them in the same take. It is a wonder we get the footage we do, sometimes, but with some ingenuity attaching the GoPro and with our new video-capable DSLR body (shamefully, bought immediately before this trip without chance to practice with it - not recommended) it is most certainly possible to put together a few minutes of film from a family trip, and I think it's nice to have evidence that we all went on the ride together, even if our relative pace on the road may mean that it grossly misrepresents the extent to which we actually ride in formation! Ten minutes' work for three seconds of film! It will be some weeks, even months hence before I will have sorted out, edited and cut the video from this trip, but I always find that the editing process is a nice way of itself to relive the places we visited and experiences we shared. It's a shame we haven't had more short days like this, and I do think it's important that families record their memories, even more so than other cyclists - not least because the children won't remember half of it! We would undoubtedly have put a couple more days like today into the schedule if it weren't for the need to fit in with both ferry timetables and Thomas Ivor and Katie's holiday dates, but either way, hopefully we will have something encouraging to show you when we get home. Our impression that the canal was somewhat energy-sapping was confirmed when we rejoined the road for the first time in many miles, which felt much better on the legs even though we had some climbing to do. A tricky little run in on freshly topped road to meet our host, Gilles, and his little girl Adélie who's three, at a much earlier arrival time than we've become accustomed to. We have been made wonderfully welcome, the bikes are parked in the garage, the girls have made another new friend and we're looking forward to sharing a meal later with another likeminded family. Something to enjoy, and something worth remembering.